Our lover boy, Eddie, is back! 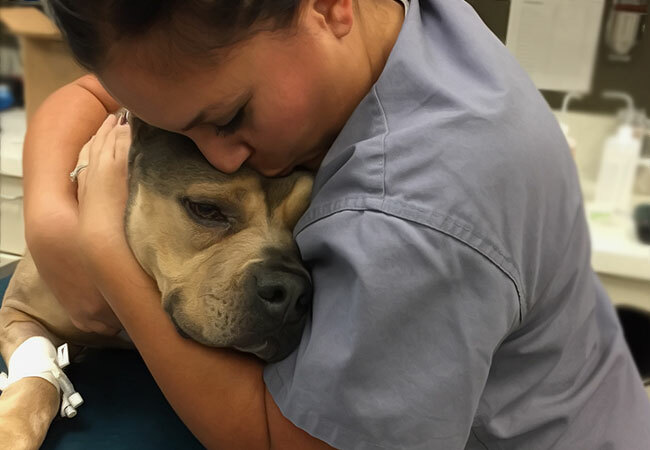 He’s seen here snuggling Erika, an RVT in surgery, but he’s been getting kisses and pets from everyone! Did you know that Labradoodles came about when an Australian breeder successfully crossed the Labrador retriever and standard poodle? They wanted to create a guide dog for the blind that would be compatible for those allergic to fur and dander! 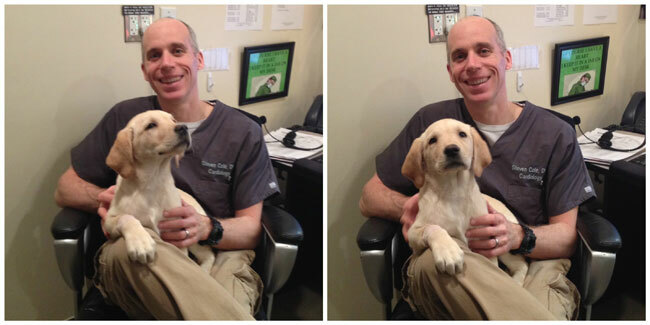 Dr. Alex Barnes saw Kobe today after some typical puppy trouble–eating out of the trash can! Luckily, Dr. Barnes determined Kobe is perfectly fine. If your pet gets into something potentially dangerous, be sure to call your veterinarian right away! 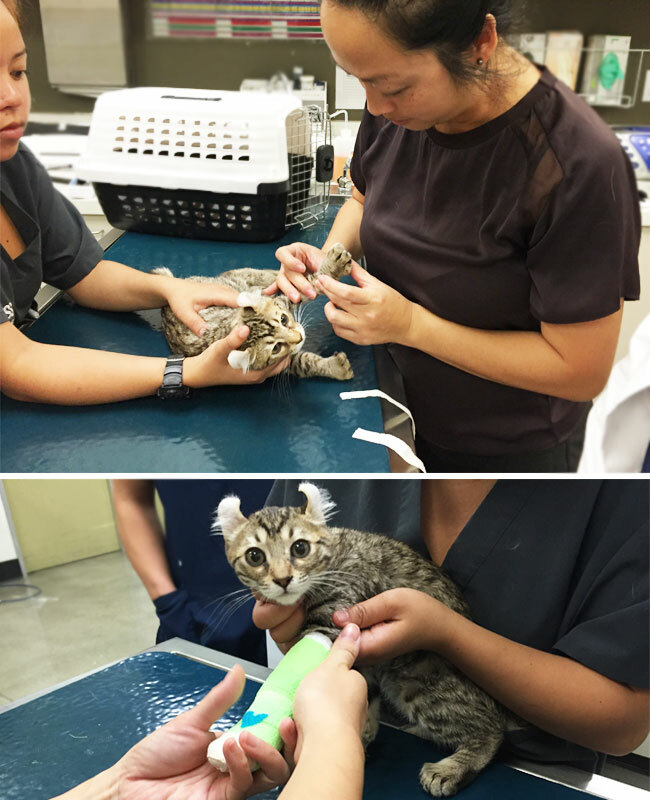 Miko is a Lynx kitten who came to see Dr. Annie Lo at ACCESS – Los Angeles for an orthopedic issue. 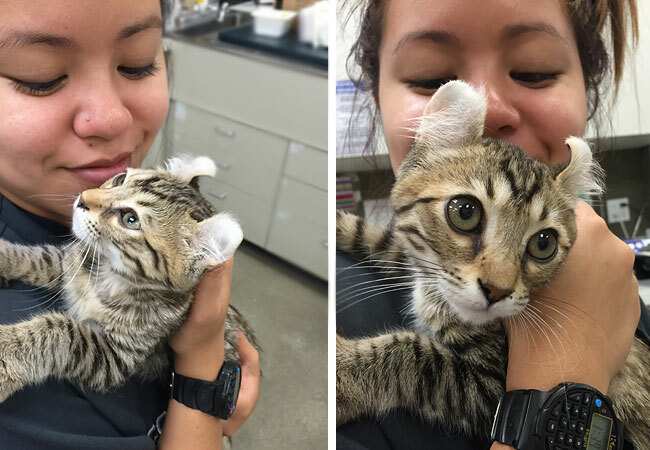 In addition to a snazzy new bandage, he received many hugs and snuggles from our staff, namely Jessica, one of the RVTs in our surgery department! 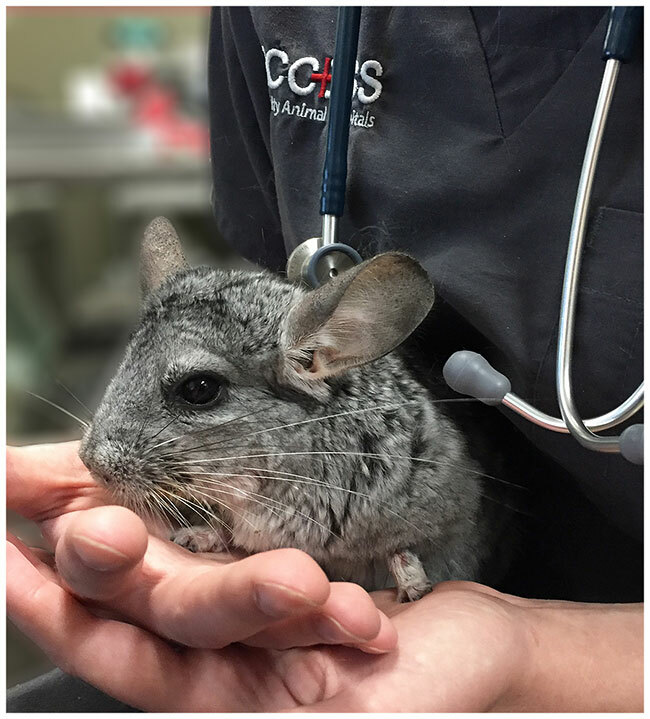 Chili Dog is an 11-year-old chinchilla who lives the pampered life at home with his dad and mom in Los Angeles. Unfortunately, Chili Dog was at home without air conditioning during the recent heatwave, causing him to suffer heat stroke. Heat stroke happens when the body is no longer able to get rid of excess heat, causing overheating and resulting in seizures, organ failure, brain damage, and eventually death. Chinchillas are very intolerant of warm temperatures because they come from high in the Andes Mountains of South America. They are at risk of heatstroke in temperatures above the mid-70s. Chili Dog’s owners knew something was wrong when they watched him collapse and begin breathing heavily. 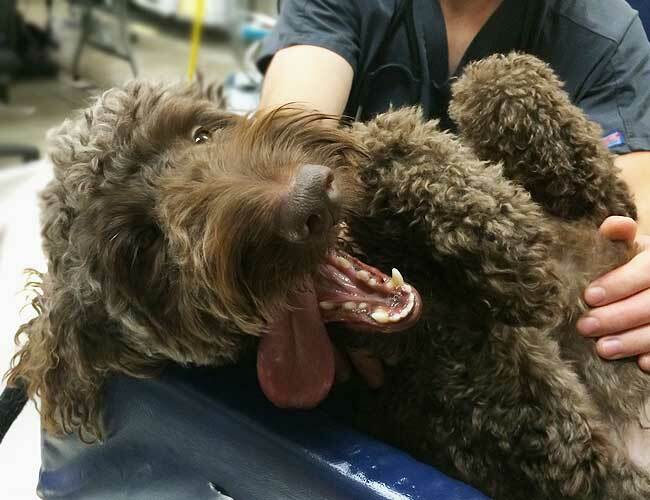 They did the right thing and wet him with water to cool him down before immediately bringing him to see Dr. Karen Schachterle at ACCESS LA on emergency. When he arrived, Chili Dog was still collapsed on his side and was minimally responsive. Dr. Schachterle confirmed that Chili Dog did have heat stroke and that his small body was also in shock. 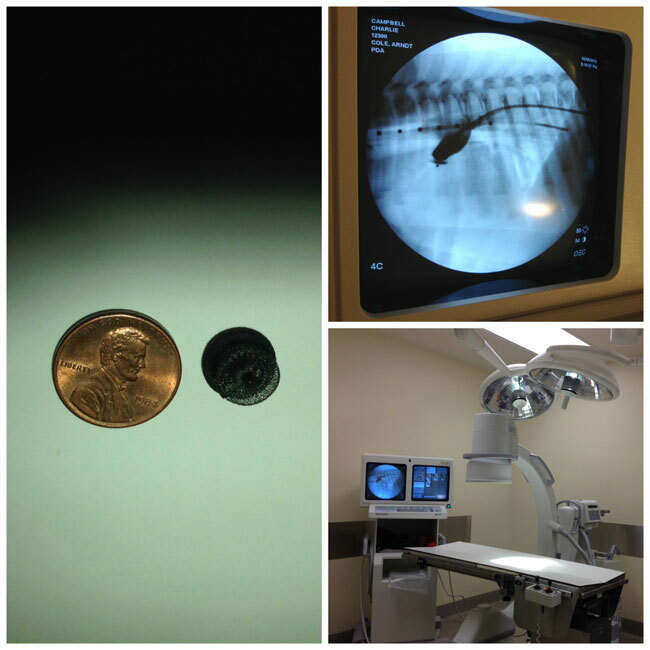 Due to the severity of his condition, Dr. Schachterle and her team had to move quickly. 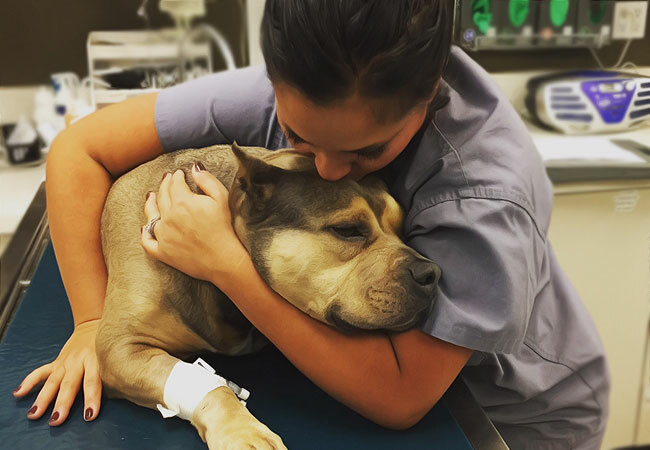 They began to stabilize him with fluids and medication, making sure to include gastroprotectants as heat stroke can cause major damage to the stomach and GI tract. They also ran bloodwork to check for organ damage and began an intensive care and monitoring protocol. It took almost twelve hours to get Chili Dog to the point where he was sitting up properly and able to eat on his own. 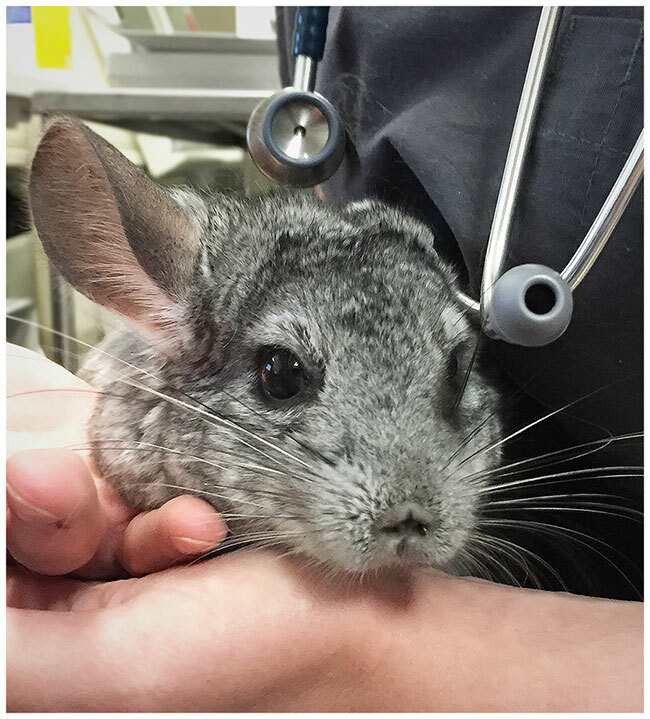 Small mammals like chinchillas need to eat frequently, as even a short fast can cause severe disease. 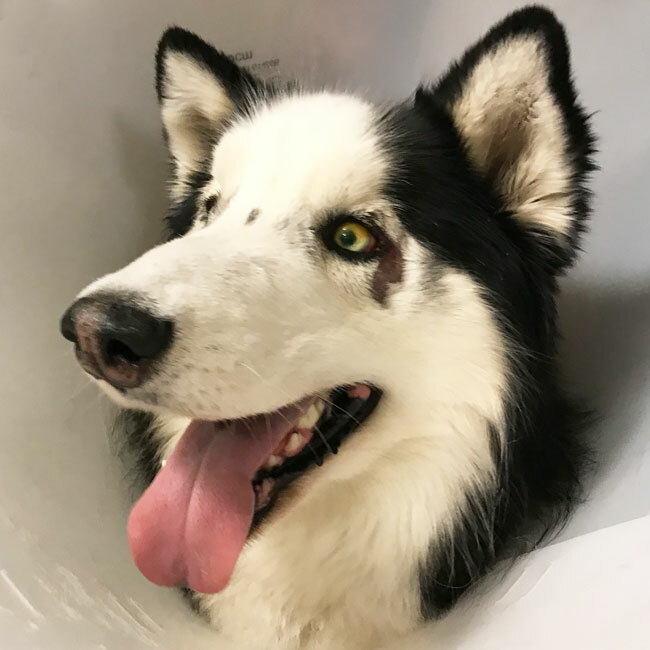 Luckily, Chili Dog survived and was able to go home with his loving family, where he was closely monitored for any further issues, as complications from heat stroke can continue to develop hours after it is diagnosed. Interventional Cardiology at ACCESS | San Fernando Valley! Charlie, a Labrador Retriever puppy, was found by her owners at a local animal shelter in Woodland Hills. From the moment they laid eyes on her, they were in love! This energetic young pup had stolen the hearts of everyone she encountered. 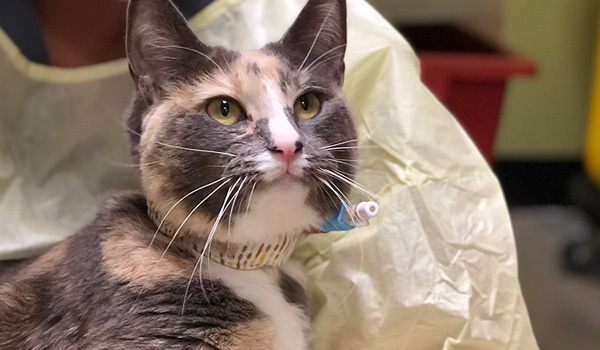 Unfortunately, a visit to their primary veterinarian’s office revealed that they may be something wrong with her three-month-old heart. 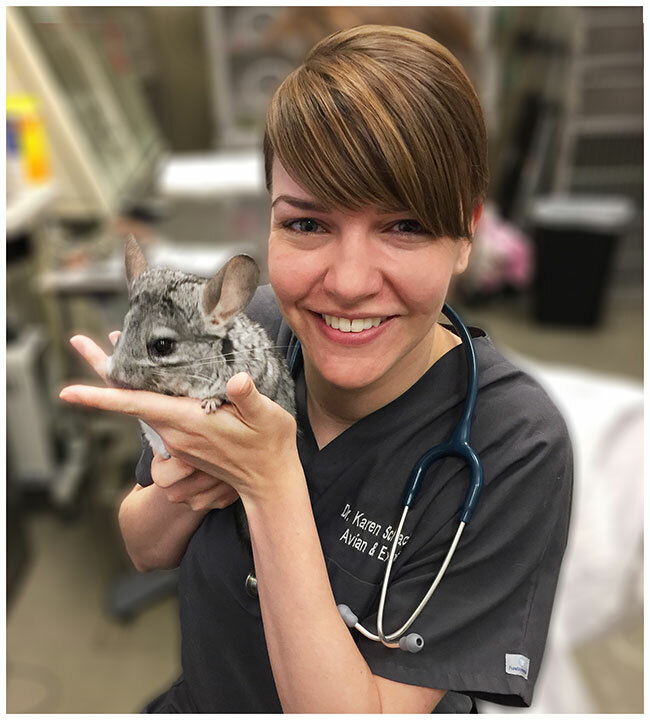 Her doctor detected a loud heart murmur; so Charlie and her new family were referred to see Dr. Steven Cole, a board-certified veterinary cardiologist and criticalist at ACCESS Specialty Animal Hospital in the San Fernando Valley. Dr. Cole confirmed that Charlie had a PDA, or patent ductus arteriosus, which is a congenital vascular communication between the aorta and pulmonary artery. This is normal for humans and animals in the womb, however in some cases, this vessel fails to close normally at the time of birth. If left untreated, a PDA can cause severe cardiac enlargement, and eventual congestive heart failure (fluid in the lungs), or pulmonary hypertension (high blood pressure in the lungs). In fact, most dogs with an untreated PDA do not survive the first few years of life. Although Charlie’s happy go lucky puppy personality didn’t show any signs of the PDA affecting her, she had significant heart enlargement, and it was likely that she would develop more serious complications if her condition went untreated. While a PDA was once only treatable with open-chest surgery, newer catheter-based procedures have been developed that allow cardiologists to close the abnormal vessel with specially-designed devices. These techniques generally result in an excellent outcome with few complications. 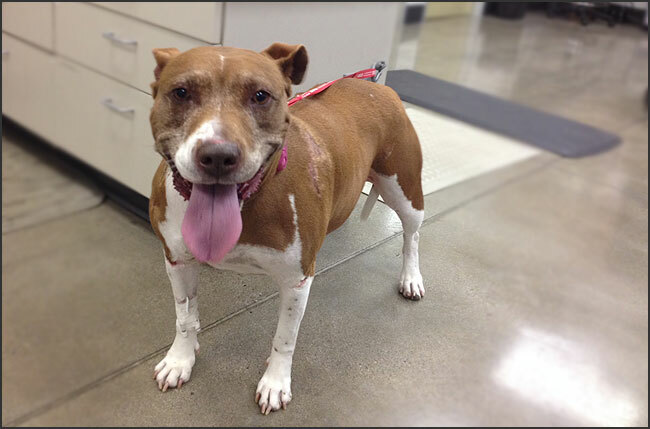 Charlie’s parents decided to proceed with the minimally-invasive procedure and to save her life. 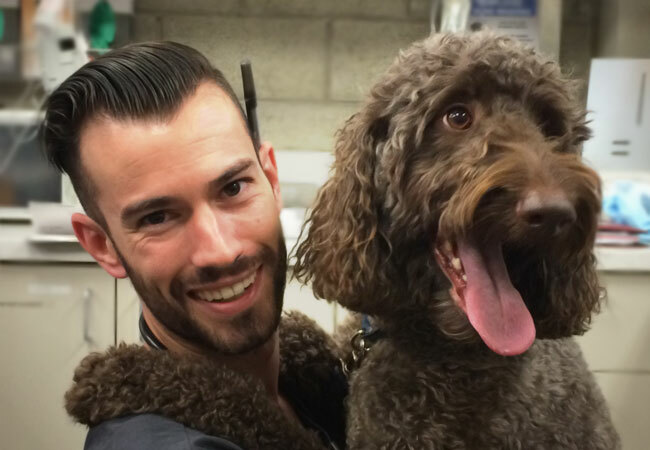 While these procedures have routinely been performed at ACCESS Los Angeles, 2015, Charlie was the very first patient to be treated in the interventional radiology suite at ACCESS in the San Fernando Valley on February 5, 2015. Dr. Cole set up an additional video screen outside of the suite so that staff members could watch the surgery and learn more about interventional cardiology procedures. About 20 staff members came to view the procedure; all of them blown away by the capabilities of our cardiologists and new equipment. Using fluoroscopy, Dr. Cole worked with Dr. Jason Arndt, a board-certified cardiologist from ACCESS Los Angeles, to see Charlie’s heart in real time. 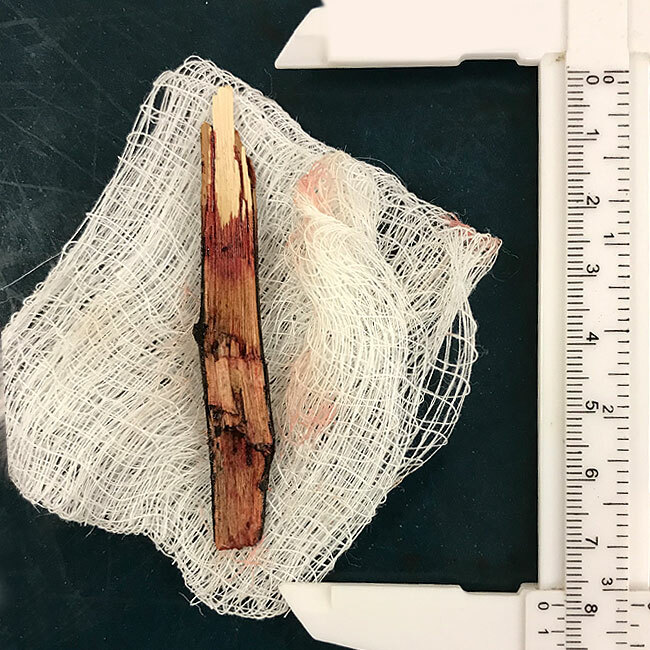 After being placed under anesthesia, Dr. Cole and Dr. Arndt made an incision that was only a few centimeters long in her hind leg. From there they were able to insert a catheter into the femoral artery and to use a contrast agent to identify and precisely measure the PDA. 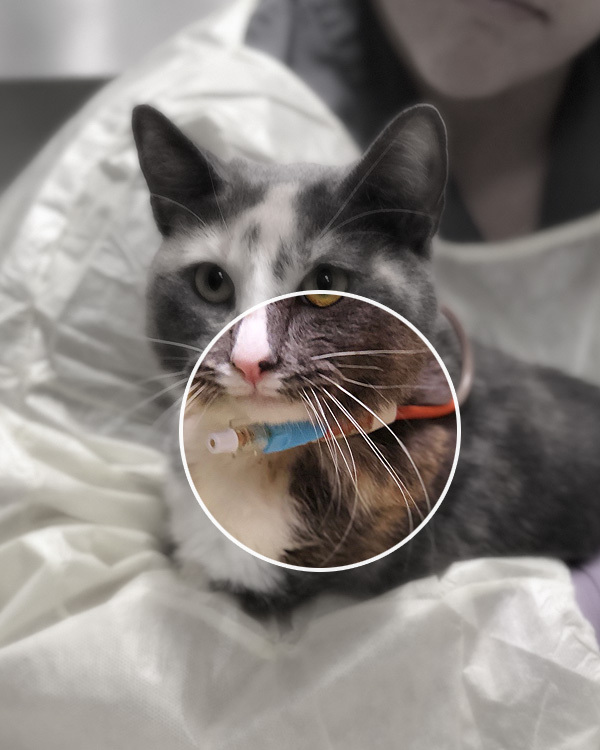 They were then able to implant a canine ductal occluder device directly into the PDA, effectively sealing the abnormal blood vessel and preventing excess blood flow into the lungs. While similar devices are used in humans, the ductal occlude device used by Dr. Cole is designed specifically for use in canine patients. These devices range in size from three to fourteen millimeters, and this allows for a wide variety of patients to be treated. Drs. 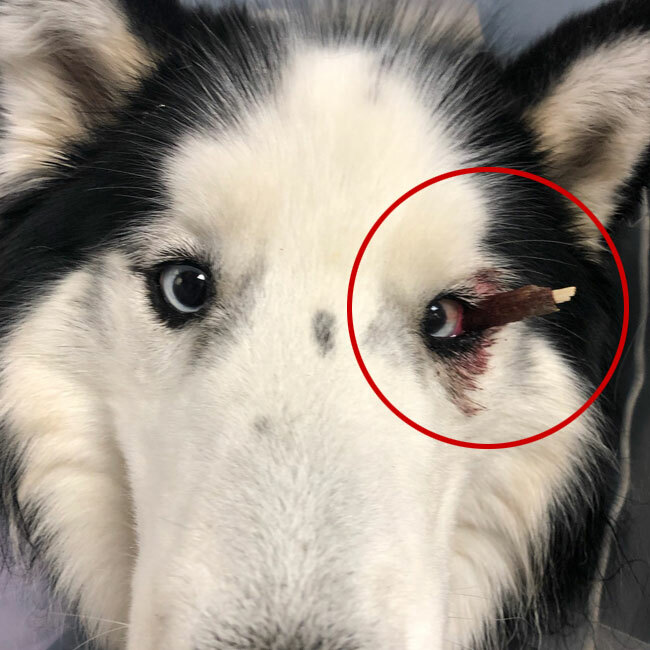 Cole and Arndt are also able to use vascular coils to close PDAs in exceedingly small dogs that could otherwise only be treated with open-chest surgery. Once the device was placed, complete closure of the PDA was confirmed, and the doctors retracted the catheters, sutured the incision, and began Charlie’s recovery process. The entire procedure took about an hour, and with three technicians and two specialists it went very smoothly. 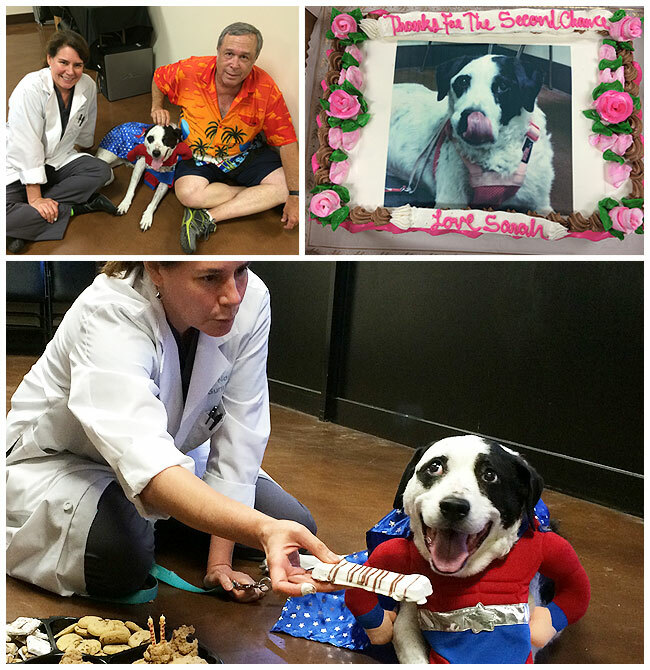 Charlie was up, running around, and she was able to go home to her family the next day. Charlie’s mom and dad were so happy with the outcome and want everyone to know that there are options to what sounds like a bleak prognosis. 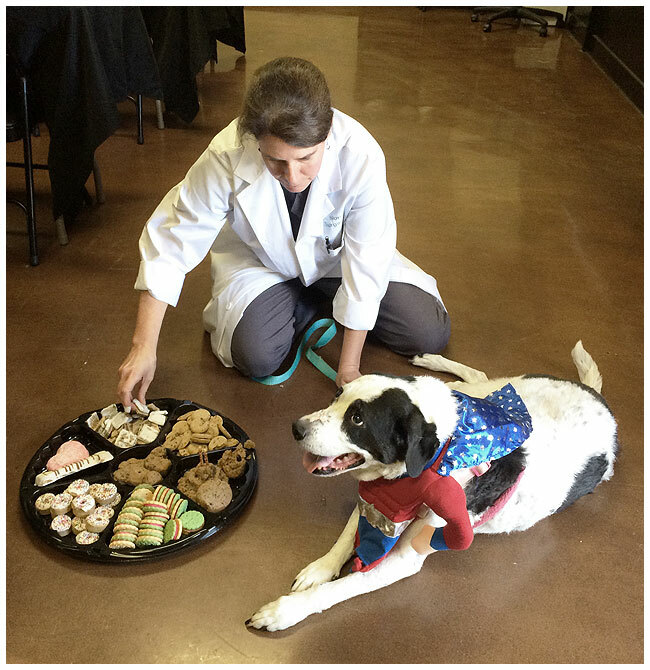 They were very thankful for Dr. Cole’s help, but more importantly their primary veterinarian, who noticed an irregularity and referred them to a veterinary specialist.